In this part of my website I have collected my own compositions, some arrangements and texts. I hope you enjoy my first strides in these areas too. 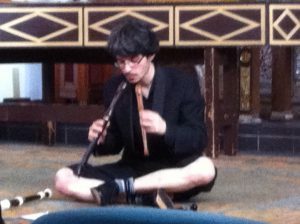 Solo piece for 2 recorders, 2 prepared recorders and voice. This piece was inspired by a few improvisations and the idea that when you travel your soul might lag behind, especially with modern ways of transportation. This gave me the thought, that perhaps we leave these minuscule fragments of our soul wherever we go, perhaps especially when we experience deeply. What would it be like to collect those like a sort of soul detective? This piece is dedicated to my late recorder teacher and musical mother Dorothea Winter. A recording is coming soon! In this piece I play 4 tin whistles simultaneously. I am still experimenting with where to go exactly. The first version went into my programme DePartita. You can here a few chords here! A spoofy composition taking renaissance rules and chaos as its basis for the Theatre Show Etudes with Opera2Day.